Check out the Epidote on Quartz, Tangerine Stellerite, Azurite & Malachite, Molybdenite on Calcite, Calcite Crystal Cluster, Quartz with Chalcopyrite, Prehnite on Epidote, Quartz on Siderite with Apatite, Tourmaline on Quartz, Manganoan Calcite, Apophyllite, Arsenopyrite, Red Heulandite with Stilbite & Chalcedony, Aegerine with Calcite, Pyrite, Vivianite, Calcite on Apophyllite, Green Quartz (Prasem), Quartz with Chlorite, Aragonite (Cave Calcite), Smoky Alligator Quartz, Blue Apatite on Quartz, Purple Fluorite with Barite, Calcite on Sphalerite and Wulfenite with Pyromorphite & Mimetite mineral specimens on this page. Aragonite is a polymorph of calcite, which means that it has the same chemistry as calcite but it has a different structure, and more importantly, different symmetry and crystal shapes. A striking and exceptional large Epidote and Quartz combination plate. Specimens of this size and quality are rare. features an impressive cluster of sharp water clear Quartz crystals to 8.5 cm. Highly lustrous, gemmy to opaque, two-toned Epidote crystals cover the Quartrz matrix. Super lustrous crystals of relatively rare Stellerite on Mordenite. From a limited new find. Vey nice formation of deep purple Azurite crystals with Malachite around the edges from new find in Laos. Fine, nice size cluster of Molybdenite crystals perched on a Calcite covered matrix from a new find in China. Well formed Calcite crytals on matrix. Attractive cluster of Quartz points with adorning golden Chalcopyrite. Pleasant green, botryoidal Prehnite crystals on dark green Epidote. Single Quartz cystal on Siderite with purple Apatite crystals. 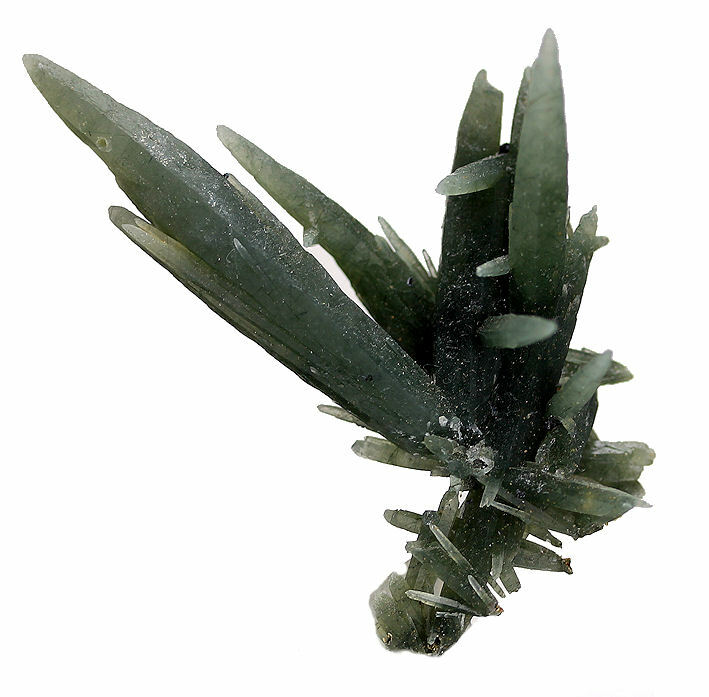 Lustrous, dark green Tourmaine crystals (to 2.5x1.2 cm), with lighter green zoning at the termination - on a cluster of Quartz. Highly sparkling, glassy crysdtals of Apophyllite. Much better in person. Sharp, highly lustrous, prismatic crystals of Arsenopyrite with minor Quartz on matrix. Aesthetic Red Heulandite with light orange Stilbite and grayish Chalcedony in a Vug. Intricate growth of lustrous, black Aegerine prismatic crystals with Calcite. Pretty cluster of modified Pyrite crystals with nice striations. Nice size, emerald green, gemmy Vivianite crystals. Gemmy, light golden Calcite crystals (4x3 cm) on a plate of scintillating Apophylitte. Aesthetic cluster of green Quartz. The green color is due to inclusions of Actinolite. Another nice specimen of Quartz with green coloring, but this time due to inclusions of Chlorite. Neat example of Alligator type smoky Quartz from Brazil. Fantastic, large cluster of milky Quartz heavily adorned with golden Chalcopyrite and, with minor Sphalerite. 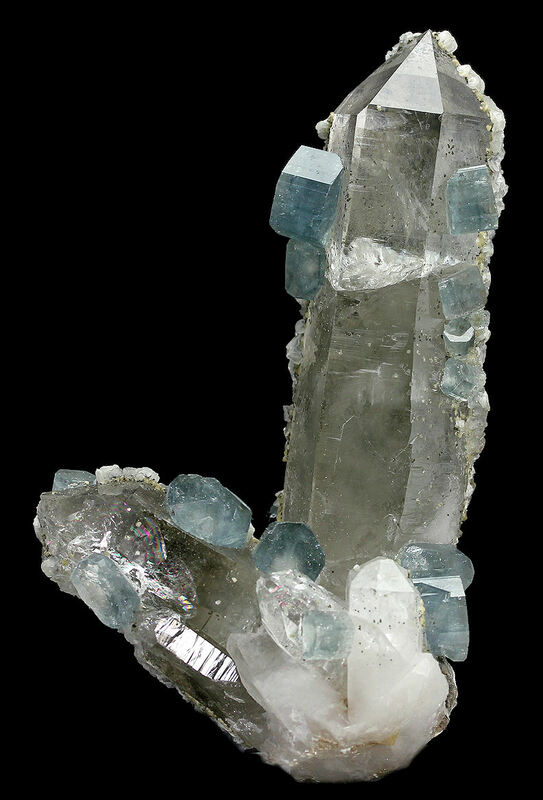 Quartz cluster adorned with rare blue Apatite crystals (to 1x1 cm). The Moscona Mine is well known for its yellow Fluorite. It fact the Mine's Fluorite specimens are almost exclusively yellow to golden in color. But, this specimen is a super rare deep purple Fluorite from the mine, which nicely decorated with little florets of white Dolomite. It is the only purple Fluorite I have ever seen from the mine. by a fellow collector -Kevin Schofield). Excellent cluster of well defined black, lustrous Sphalerite crystals with an upper trim of Calcite rhombs. Very Attractive specimen of lustrous, butterscotch colored Wulfenite crystals with nice coverage on both sides. Very rare dark brown to black, lustrous Heulandite crystals on a matrix of Chalcedony and Apophyllite with Stilbite.